Latin American Literature Today is a journal associated with World Literature Today that seeks to reflect new realities of Spanish-language literature through a quarterly online publication, circulating in the United States as well as the literary communities of Latin America and Spain. By 2030, the United States will be the country with the largest Spanish-speaking population in the world. Today, 122 million people use Spanish on the Internet, making Spanish the third most common language on the web. 90% of the 500 million Spanish-speakers in the world live in the Americas. By 2043, one in every three Americans will have Hispanic origins. According to a report by Mónica Lozano, Chairman of the Board of U.S. Hispanic Media Inc., there are now an unprecedented 57 million Hispanics living in the United States. Fuentes wondered, only to respond immediately, “I shall propose a name that encompasses us in terms of language and imagination without sacrificing variety or substance. We are the Territory of La Mancha.” This Territory of La Mancha will be the source and subject of Latin American Literature Today. 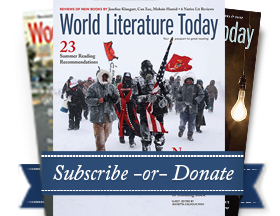 Our parent publication, World Literature Today, is one of the oldest and most distinguished literary periodicals in the United States. It was founded at the University of Oklahoma in 1927 with the name Books Abroad, and after nine decades of continuous publication, the journal continues its mission of publishing outstanding literature and literary criticism on an international scale. Every issue of WLT includes fiction and poetry from both recognized and up-and-coming writers, along with book reviews, interviews, and articles on literature and culture. The Nobel Prize Committee has recognized WLT as one of the “best edited and most informative literary publications” in the world. Besides its digital and print editions, World Literature Today is renowned as the sponsor of both the Neustadt International Prize for Literature and the Puterbaugh Festivals of World Literature and Culture. The Neustadt Prize is often called “the American Nobel,” as thirty of its laureates, candidates, or jurors have gone on to win the Nobel Prize in Literature. Past winners of the Neustadt Prize include Gabriel García Márquez, Octavio Paz, and Álvaro Mutis. Past Puterbaugh Fellows include Jorge Luis Borges, Octavio Paz, Julio Cortázar, Mario Vargas Llosa, Carlos Fuentes, Guillermo Cabrera Infante, Manuel Puig, Luisa Valenzuela, Roberto Fernández Retamar, and Andrés Neuman.